Classic company has provided a rental style shoe at a very affordable price. 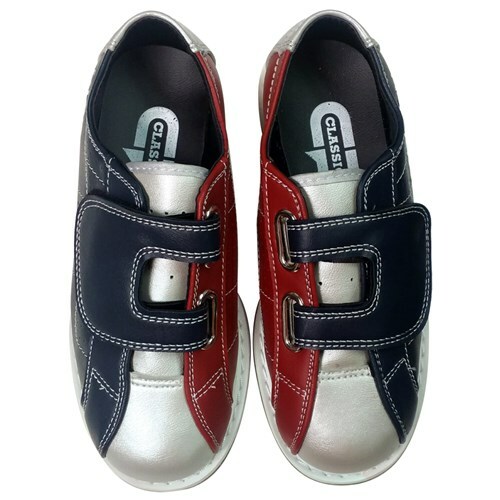 These shoes are perfect if you just need a simple pair for your kids to take to the bowling alley. They are brand new shoes that are the rental style you would see at a bowling alley. Much better than renting shoes for my son! Bought these for my son to save money and not have to wear overused rental shoes. My 3 yo son loves having his own bowling shoes and they fit as expected. As others mentioned would prefer they didn't say rental on them but since he grows out of shoes so fast we wanted to least expensive pair we could buy. I will probably buy these again next summer in a bigger size for summer bowling program. Great for summer bowling activities with kids. The prize and the shoes are great for kids. Great vintage price, practical, and at a tremendous value! Bought these for my daughters last summer for kids bowl free program and they were too tight. Thank goodness I did buy the surefit protection. Purchased these for my kids. Decent shoe. The only thing is I wish the velcro strap was larger. They don't have wide feet and the velcro part fit small on both of them. Otherwise a good youth shoe. I ordered my children's shoe sizes and all of them were too small. I suggest buying a size or even 2 bigger than their shoe size. Otherwise they seem like good bowling shoes to use for kids bowl free over the summer. My kids love these shoes. I love them because there are no laces to tie! These were perfect for my 4 year old for the perfect price. Beats paying each time we bowl. We go at least once a week! Couldn't ask for a better deal. He lives them! Great product great price we already told people about them. It's best to have your own rental shoes then to rent shoes lol I live with sanitizer and so do my kids and when we saw that they didn't clean the bowling rental shoes we decided that we had to buy our own. As the kids grow we will buy the next size and the next size and the next size thank you bowling.com we are happy!!! They do the job well. the kids don't seem to mind the stiffness because they're having too much fun bowling and making strikes. Kids were signed up for free bowling, but the charged for rentals. These were the right price to where they paid for themselves. Signed up for free summer bowling for the kids and didn't want to spent a ton on shoe rentals for the summer. Purchasing these for my kids enables us to recoup our rental cost in less than six uses, and being gender neutral enables us to pass them from one kid to the next. They DO say "rental" along the sides, but other than that, a cheap good alternative to renting if your kids will get enough use out of them before they are outgrown. NOTE: Be sure to order a size up, as they run on the small side. These are great shoes for kids enjoying the kidsbowlfree.com summer program! Beats paying the $3 shoe rental each time we all play! I bought a pair for myself and they work just as good as any of the rentals in the adult size as well! But 3 of these for my kids. Work great and I'm sure my youngest will be able to use all three pairs before I have to give them away. Thanks for the deal. Disregard reviews to size up. My daughter wears 11 in little kids and we ordered up to a 13 and they are HUGE!!!! I am reordering her normal size. Bought for the grandkids to participate in the "kids bowl free" summer program. I bought these shoes for my grand kids for the summer. They like the looks of the shoes and enjoy bowling in them. After reading all of the reviews I sized up one size for my kids. Both were too big. I went back to their regular sneaker size and they were still too big. Just sent them back for another smaller size. I don't understand why everyone else thought they ran small. I bought this a size 12 which is a bit big for my 5 years old. But it's a hit or missed as he sometimes wears 11 or 12. Oh well he can wear another year. 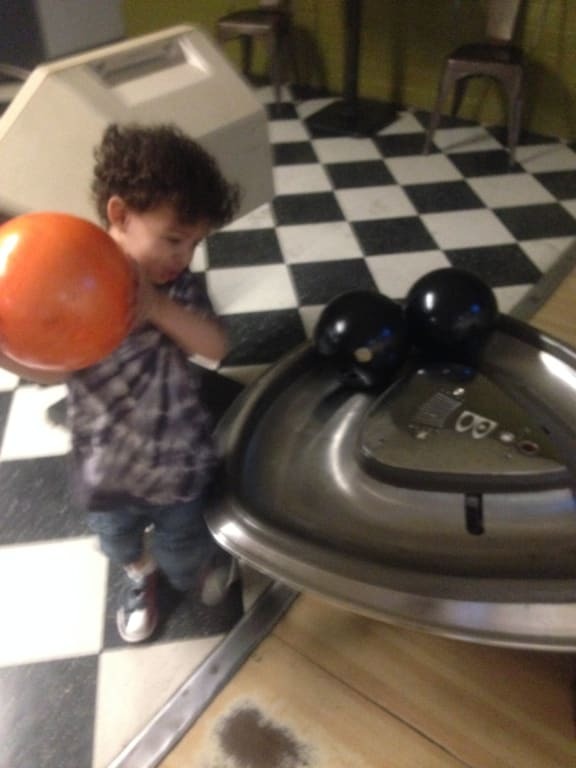 He loves bowling! I read the reviews, most stating to order a couple sizes larger, so I did. Big mistake! Unfortunately, I didn't select the true fit guarantee, so the shoes are way too big for my kids. Shame on me. They are a good shoe for the price and evens out instead of renting at the lanes. Purchased June 2015, so maybe the manufacturer has fixed their sizing flaw? The first pair we received, the bottom of the wood was warped bad. It also doesn't say in the discretion that the bottom is just wood. Hello, the 5 should fit along the sizing of a youth size 5 in regular athletic shoes. We also offer a TrueFit Guarantee for purchase if you are unsure of the sizing. the size 9 and 11 - are they toddler sizes? Hi! Yes, sizes 7-13 are toddler sizes while sizes 1-5 are youth sizes. 3 of 6 customers found this answer helpful. Did you? Yes | No Did you find this answer helpful? Yes | No Thanks for your feedback! Hello! Sizes 7-13 are toddler sizes while sizes 1-5 are youth sizes. Do you guys have a sizing chart? Hello Sam! We suggest you going with the shoe size you normally wear. I would also recommend purchasing the True Fit Guarantee just in case they do not fit the way you want them to. What is true fit? Can I get more info on thos option? Thanks for the question Jen! Our products will fit you perfectly, or we'll exchange them at no additional cost to you! We'll pay all the shipping costs! Just try them on, and if they don't fit, exchange them for the right size. We'll ship the replacement immediately. Make sure the shoes are in perfect condition before sending them back! For the kid sizes are they big kids? Hello Steph! The sizes marked 7 (Children's) through 13 (Children's) would be for smaller children and the sizes marked 1 through 5 are for the bigger children. I'm ordering 3-r pair. Is the sure fit plan cost per pair or per order? Hello! You would need a true fit plan for each pair you are wanting to purchase. Hello Janine! I would probably recommend purchasing whatever size they wear in their everyday shoes. The shoes at the bowling alley might be more stretched out because of how many people wear them. I would also recommend purchasing the True Fit Guarantee just in case the shoes don't fit. It will make our exchange process faster and easier. Do all the kids shoes have Rental on them? I didn't realize when I ordered and I was embarrassed when they asked me to return the shoes to desk. Hello. 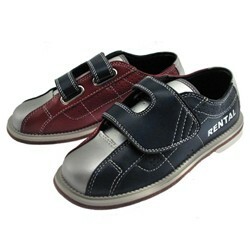 We have other kids shoes that do not say rental. If you go to the shoe selector and click on kids shoes they will all come up. If they do not fit, can I exchange them even if I don't have sure fit protection? What would my costs be? Are these boy, girls, or unisex? Hello Lee. The Classic Kids Rentals will be unisex sizing. I'm trying to be the sneaky aunt and do this on the sly, so I can't ask for info from my niece. She is 8 yrs old and wears a girls' size 13. What size would you suggest in your shoes? 6/2/2017 - By "Kids Bowl Free" isn't free! I would try the normal size she wears and purchase the True Fit Guarantee in case they end up being too large or too small. Is the bottom supposed to be just wood? Minis the rubber heal? The bottoms of these shoes will be leather. They should be available by the first week of July. Due to the time it takes to produce the Classic Kids Rental ball it will ship in immediately. We cannot ship this ball outside the United States.